In hidden catacombs beneath London, a second Queen holds court: Invidiana, ruler of faerie England, and a dark mirror to the glory above. In the thirty years since Elizabeth ascended her throne, fae and mortal politics have become inextricably entwined, in secret alliances and ruthless betrayals whose existence is suspected only by a few. Two courtiers, both struggling for royal favor, are about to uncover the secrets that lie behind these two thrones. 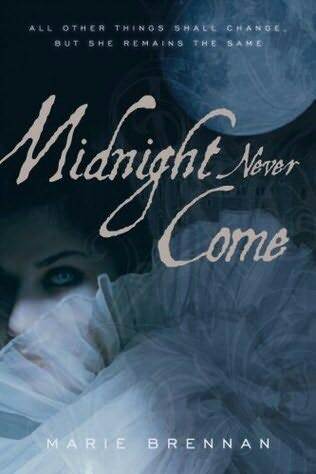 When the faerie lady Lune is sent to monitor and manipulate Elizabeth’s spymaster, Walsingham, her path crosses that of Michael Deven, a mortal gentleman and agent of Walsingham’s. His discovery of the “hidden player” in English politics will test Lune’s loyalty and Deven’s courage alike. Will she betray her Queen for the sake of a world that is not hers? And can he survive in the alien and Machiavellian world of the fae? For only together will they be able to find the source of Invidiana’s power — find it, and break it . . . .
Oh, what a deliciously written book. I have never truly read a book about the fae, but with it’s taste of historical fiction, this definitely sounded intriguing. I had picked this up soon after it came out and it has just been sitting on my bookshelf. I am so glad I did, and I wish I had read it sooner. The author’s writing was lovely; I don’t know how else to describe it but it really was just so good and I felt like I was reading something that a true word-artist wrote. Does that make any sense? Either way, if you can, and if you like historical fiction, even if the idea of the faeries playing a part in history doesn’t sound that appealing, give it a shot. It worked so well. The intricate politics and the world of the fae was wonderfully described. Both fae and mortal characters were quite real in my head and I could easily picture them as I was reading along. And, oh, that Onyx Court…I would have loved to see an artist’s rendering of it, in all it’s dark beauty. The relationship between Lune and Deven was not so heavy handed, and I mean that in a very good way. They both knew what their priorities were and they dealt with them, but at the same time, they grew to love and respect one another. The summary above pretty much sums up the story, so I don’t want to give anything else away, but it does not do the book justice as a reading experience. I kept trying to think how I could put my thoughts down about this book but it was just so darn hard cause it was unlike anything I had ever read. And I can’t help but picture Geoffrey Rush as Walsingham in this book. I will most certainly be reading the follow-up to this book, In Ashes Lie, and I saw on the author’s website that a third one is due to be published this year. I’ve been disappointed in a lot of the fairy books I’ve read, but this one sounds great! Thanks for bringing it to my attention! I love reading about fairy’s. Love them. This one seems to be very good! I like that it’s also has to do with some history of England. Or am I reading it wrong? Adore the COVER! I love this cover. Definitely want to read this.